Installations in the dwelling-house for space heating and heating water. It is also highly recommended that householders have an electrical inspection in the home carried out every ten years or change of occupancy. This may change depending on the condition of the installation, and this would be based on the previous periodic inspection recommendation. In some cases, an installation may not have been inspected and tested for some time, therefore there is no record of the next recommended date of inspection. In this case, the new or existing owner of the property should consider having an inspection carried out. An electrical fault on an installation can cause electrical fires and potentially fatal electric shocks. Regular checks will reduce the risks of this happening. Competent and registered installers will be able to undertake these inspections and help to reduce the likelihood of electrical fires. Portable Appliance Testing (PAT) is normally undertaken in industrial and commercial premises and is the duty on the landlord for rented properties under the Landlord and Tenant Act 1985. As stated above, electrical equipment provided by the landlord for use by the tenant(s) e.g. kettles, toasters, electric cookers etc. should be tested at the recommended intervals in accordance with the IET Code of Practice for In-service Inspection and Testing of Electrical Equipment. Fixed Appliance Testing (FAT) on items such as storage heaters, cookers and hand driers should also be carried out at recommended intervals. Regular electrical inspections could be the difference between life and death, with electricity being amongst the main causes of fires in the UK. Between 1st April 2010 and 31st March 2015 there were over 36,000 accidental dwelling fires in England where the source of ignition was “Electrical Distribution” or “Other Electrical appliances”. The sheaths of the cables of individual electrical circuits may have deteriorated to such an extent that they need replacing. An electrical circuit may have suffered mechanical damage that reduces its capacity to safely carry the load current to which it is subjected. The electrical systems may have protective devices that are no longer functioning correctly and which could fail when a fault occurs e.g. the RCD has seized and does not trip when a fault occurs. Metal light fittings or accessories may not have a protective earth connection within the lighting circuit leaving the householder at risk of an electric shock should the fitting or accessory develop a fault. Lack of or undersized earthing conductor within the installation which could leave you vulnerable to the risk of electric shock. Lack of or undersized main protective bonding conductors to your gas and water installation pipes within the installation which could leave you vulnerable to the risk of electric shock. The best way to ensure your electrics are safe is to have a Periodic Inspection by having an Electrical Installation Condition Report (EICR) carried out. An EICR should be carried out by a competent, registered electrician with experience of carrying out inspecting and testing within the last five years or within the time frame determined by the electrical installer. This then confirms, as far as possible, whether or not the electrical installation is in a safe condition for continued service, and the nature of any work that may be required to bring it back to a safe condition. 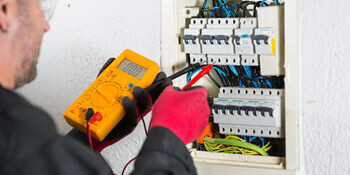 Having your electrics inspected will reduce the chances of a fault occurring and help to keep you and your family safe. PAT testing of any household appliances supplied by a landlord will check their safety. These types of work should be carried out by Full Scope Part P Registered Competent Electrical Installers, registered with a Competent Persons Scheme such as NAPIT. If you’re interested in the testing and inspection for electrics within for your home or property, why not compare prices by completing our quick form and receiving FREE quotes from up to four reputable local electricians in your area. Project: various 13 amp catering equipment appliances. There are also some 3phase appliances. Excellent service. very polite and knows his job. Have already recommended to a friend who is looking to have some work done on her House. Homes are given an energy rating dependent on how efficient they are and ratings are presented in the information below. This ranges from A, the most energy efficient, to G, the very least efficient. With a higher rating you're more likely to have less expensive energy bills as more heat will probably be retained in the house. You'll be able to improve your home's efficiency with insulation including upvc double glazing, loft lagging or wall cavity insulation. The information beneath indicates the several types of houses within Uk. The most commonplace homes throughout the UK are detached and semi-detached homes. Various other homes encompass terraced houses, flats, converted flats and bungalows. The pie chart below displays the percentage of households in Uk that are central heated and non-central heated. Central heating figures within the vast majority of UK properties, including those on the gas grid and homes heated by oil and electric. The data beneath reveals the spread of households heated by various fuels. Throughout the United Kingdom the most frequent by far are gas heated houses, followed by electricity and then oil. Biomass central heating boilers are also rising in popularity, heated by green products such as wood pellets or agricultural waste.|Homes in the UK are heated by a variety of fuels, which include gas, electricity, oil, solid fuel and LPG boilers. Each fuel has a varying cost associated with it so you might find yourself with more affordable energy bills by changing how your home is heated. Even solar thermal panels are being considered by many in order to lower heating bills for the many years to come.